St. Joseph’s Parish will hold its annual picnic on Sunday, June 27, 2009 from 1:00 p.m. to 5:00 p.m. at Streetsville Memorial Park. To help with our food preparation (we will provide hot dogs and hamburgers), we need to know the number of people attending. Families are asked to bring a dessert or a salad. Fresh lunch will be served throughout the day. Please fill out the form below which will become a ballot for prizes, and submit it to the parish office on or before Sunday June 20. Volunteers are welcome. To volunteer, please call Silvestro Ruscetta at (905) 542-3167. On June 6th we will celebrate the Solemnity of Corpus Christi. This Solemn celebration reminds us that a precious gift has been entrusted to us in the Most Holy Sacrifice of the Mass. We are also reminded that the Lord who is truly and really present in the Blessed Sacrament has the power to transform the world! Tradition has it that on Corpus Christi we take this precious gift of the Eucharist and we bring it to the world. We share it with our neighbours in a simple yet solemn way. The Corpus Christi Procession is an act of devotion and an act of faith. We allow the Lord who is truly present in the Eucharist to walk the streets of our Community - allowing him to touch our brothers and sisters. 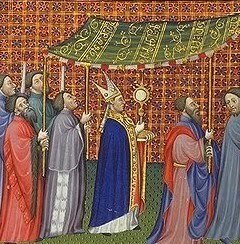 I invite us all to participate in this year’s Corpus Christi Procession. The Procession will start immediately following the 12.30 p.m. Mass. We will then process along Durie Road to Bristol Road, making a stop on Bristol Road and continuing onward towards St. Joseph Elementary School where Benediction will be celebrated. Refreshments and Fellowship will follow. Please note that there will be a shuttle service between St. Joseph’s Elementary School and our Parish Church to assist those who might not be able to walk back. On the Feast of Corpus Christi (June 6, 2010) we will be having a Eucharistic Procession following the 12:30 p.m. Mass. We will be processing from the Church to St. Joseph School. All are welcome to attend. Refreshments and fellowship will follow. If you wish to participate in being a candle bearer or help in carrying the processional canopy, please leave your name in the Parish Office. Holy Spirit, third Person of the Blessed Trinity, Spirit of truth, love and holiness, proceeding from the Father and the Son, and equal to Them in all things, I adore You and love You with all my heart. Dearest Holy Spirit, confiding in your deep, personal love for me, I am making this novena for the following request, if it should be Your holy Will to grant it: (mention your request). Teach me, Divine Spirit, to know and seek my last end; grant me the holy fear of God; grant me true contrition and patience. Do not let me fall into sin. Give me an increase of faith, hope, and charity, and bring forth in my soul all the virtues proper to my state of life. Make me a faithful disciple of Jesus and an obedient child of the Church. Give me efficacious grace sufficient to keep the commandments and to receive the sacraments worthily. Give me the four Cardinal Virtues, Your Seven Gifts, Your Twelve Fruits. Raise me to perfection in the state of life to which You have called me and lead me through a happy death to everlasting life. Through Christ our Lord. Amen. Our parish Catholic schools invite parishioners to join them in celebrating Catholic Education Week 2010, which runs from May 2-7. During this week, the Catholic community celebrates the distinctive contribution that Catholic schools make to our students, our community, to our society and to the province at large. Catholic education continues to integrate Gospel values into every aspect of the school’s life and curriculum. Thanks to all those who provide leadership in our Catholic schools. We pray for all educators and students, giving thanks to God for all those who faithfully spread the Good News.